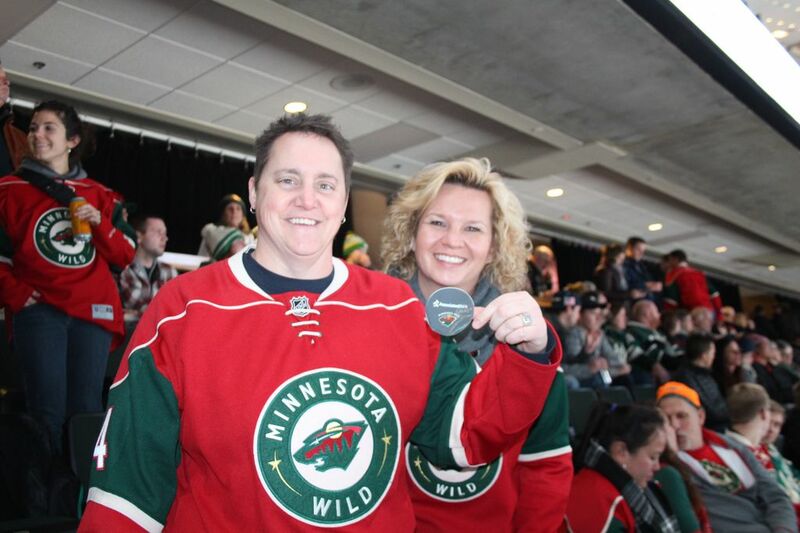 A lucky winner found a winning puck sticker at Xcel Energy Center during a recent game as part of Associated Bank’s Puck Drop. During a recent Minnesota Wild game, thousands of fans were surprised by an in-arena announcement to search under their seats for one of 25 hockey puck stickers that will get them exclusive access to the Wild in February. The Puck Drop winners and a guest will be invited to meet and take photos with Wild hockey favorites Charlie Coyle and Jason Zucker during Associated Bank’s Wild Fan VIP Party at Xcel Energy Center. Each winner will also take home an autographed image of both players. An additional Puck Drop will be held later in the season. Fans who don’t find a sticker under their seat can also go to AssociatedBank.com/WildFan to create their own Wild Fan Card for a chance to attend the Wild Fan VIP Party. Simply upload a photo, choose their favorite hockey card design and a hockey nickname (i.e. Glove Dropper, Bench Warmer, Brick Wall) and create a personalized fan card. Fans are encouraged to share their cards on social media. For more information, visit AssociatedBank.com/WildFan.